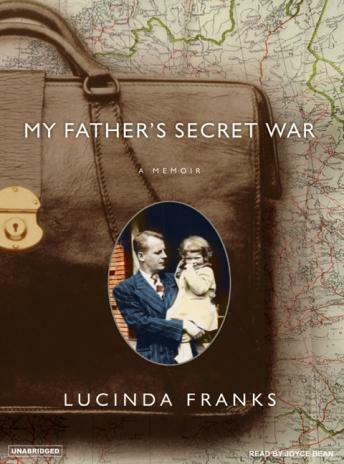 In this moving and compelling memoir about parent and child, father and daughter, Pulitzer Prize-winning writer Lucinda Franks discovers that the remote, nearly impassive man she grew up with had in fact been a daring spy behind enemy lines in World War II. Sworn to secrecy, he began revealing details of his wartime activities only in the last years of his life as he became afflicted with Alzheimer's. His exploits revealed a man of remarkable bravado-posing as a Nazi guard, slipping behind enemy lines to blow up ammunition dumps, and being flown to one of the first concentration camps liberated by the Allies to report on the atrocities found there. My Father's Secret War is an intimate account of Franks coming to know her own father after years of estrangement. Looking back at letters he had written her mother in the early days of WWII, Franks glimpses a loving man full of warmth. But after the grimmest assignments of the war his tone shifts, settling into an all-too-familiar distance. Franks learns about him-beyond the alcoholism and adultery-and comes to know the man he once was. Her story is haunting, and beautifully told, even as the tragedy becomes clear: Franks finally comes to know her father, but only as he is slipping further into his illness. Lucinda Franks understands her father as the disease claims him. My Father's Secret War is a triumph of love over secrets, and a tribute to the power of the connection of family. I absolutely loved this book. I just loved seeing how the authors relationship with her father emerged. Also the story itself was so interesting. I would stongly reccomend this to anyone.